Grundl was hailed as a hero for his actions. Since then, his story has gotten a lot of attention. On his Twitter account, Grundl says he's gotten calls from news stations in Milwaukee, as well as national news outlets such as GMA. NBC26 also interviewed Grundl. But Grundl says he didn't do it for attention and he was ready to move on, which included going to a Taylor Swift concert. He friends, however, had other plans. Grundl says his friends and other people started tagging Taylor Swift on social media. Eventually, Taylor Swift got the message, and Grundl got to meet Ms. Swift at the concert. It would be fair to say the past couple of weeks have been a whirlwind for Joey Grundl. First, Grundl became a hero when police say he alerted them to a kidnapping while delivering a pizza. Then, after the story got widespread attention, Grundl got to meet one of his favorite stars, Taylor Swift. This has been one of the most exciting weeks of my life. It came out of nowhere. I had planned for about a month to go to the final Taylor Swift concerts and it turned into soooooo much more. It started with the pizza delivery. On September 27, Grundl delivered a pizza to a home in Waldo. Grundl says a man answered the door, but Grundl also saw a woman with a black eye standing behind the man, mouthing the words, "help me" and "call the police." Police entered the home and arrested the man, identified as 55-year-old Dean Hoffmann, the woman's ex-boyfriend. Authorities say the man had entered the woman’s home earlier in the day, punched her, tied her up with a power cord and tried to convince her to get back into a relationship with him. Grundl was hailed as a hero for his actions. Since then, his story has gotten a lot of attention. On his Twitter account, Grundl says he's gotten calls from news stations in Milwaukee, as well as national news outlets such as GMA. NBC26 also interviewed Grundl . But Grundl says he didn't do it for attention and he was ready to move on, which included going to a Taylor Swift concert. He friends, however, had other plans. Grundl says his friends and other people started tagging Taylor Swift on social media. Eventually, Taylor Swift got the message, and Grundl got to meet Ms. Swift at the concert. 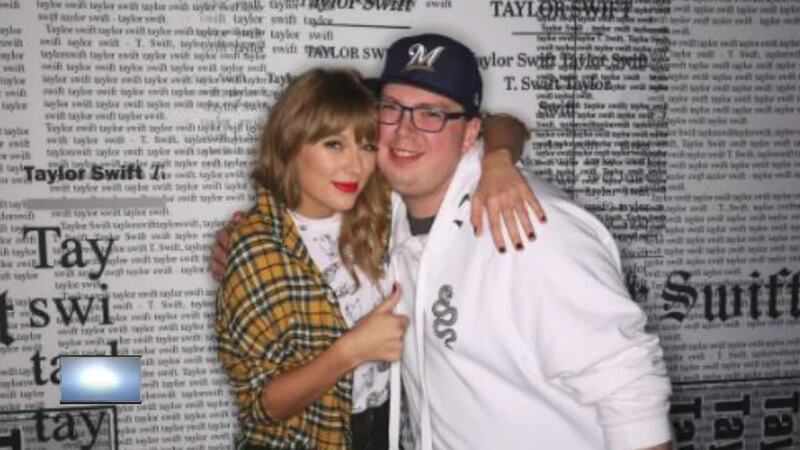 On Twitter, Grundl thanked everyone who had called him a hero and helped him meet Taylor Swift. He says this has been one of the most exciting weeks of his life.